Not too long ago, just a few rail journeys in the world had real market profile, but that number has grown as travelers have come to appreciate the beauty of land cruising. Some folks find it more interesting to look out on actual scenery rather than waves. This list of 10 of the world’s top trains is designed to give you a hook for each experience. 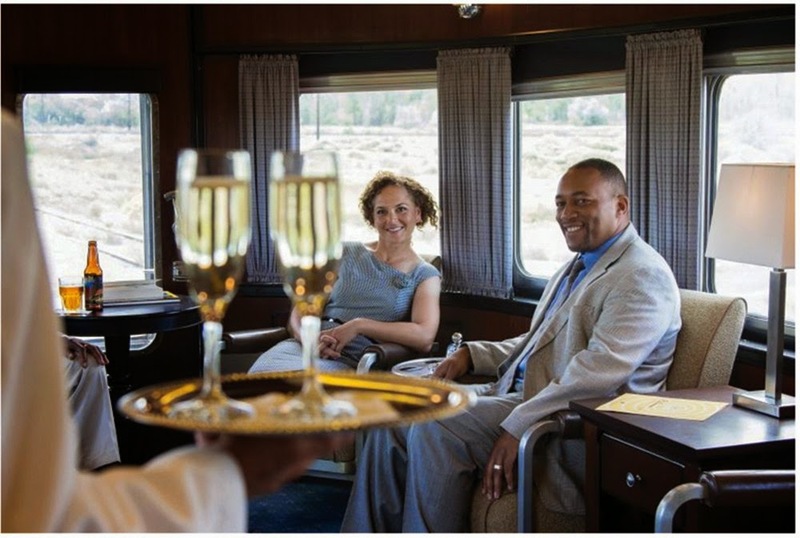 Pullman Rail Journeys is a rolling Smithsonian of American cultural history with its feel of Art Deco luxury and authentic cuisine from a bygone era of American dining. Pullman Rail Journeys connects Chicago and New Orleans with twice-weekly southbound and northbound service, and now offers a New York-to-Chicago journey via Washington, D.C.
You can’t position this as a modern luxury experience, because the bulk of the accommodations are in berths, just like the old days, though the Pullman offers a twin cabin. The Pullman goal is authenticity, and to many lovers of rail, that is its own kind of luxury. The Rocky Mountaineer, a Travvy Award Winner, is celebrating its 25th anniversary. Over the past 25 years, this train has gone from a local passenger service to one of the highest-rated leisure train rides in the world, carrying more than 2 million passengers. The Canadian Rockies and the Pacific Northwest offer a majestic backdrop for 45 scenic rail packages all based on five core routes with experiential options and hotel stays that can be added to create different journeys. The Rocky Mountaineer offers three tiers of service: RedLeaf, SilverLeaf and the top of the onboard service, GoldLeaf. The growth in sales is in the upper tiers, and combinations with Alaskan cruises out of Vancouver and Seattle are immensely popular. The Belmond Royal Scotsman moves at an easy-going 40 to 50 miles an hour offering an Edwardian-style grand rail tour of Scotland. Nine Pullman carriages, carrying 36 passengers, conjure up a private club feel with mahogany-paneling, brass fixtures and plenty of tartan and tweed. The Observation Car features plush sofas and armchairs as well as an open-air veranda and a bar. Chefs prepare menus paired with wines, incorporating fresh Scottish produce and delicacies for the two Dining Cars. The Sleeping Cars feature 16 twin State Cabins measuring 85 square feet and four single accommodations measuring 55 square feet, all with picture windows and lower single beds, dressing tables, full-length wardrobes, windows that open and private bathrooms. The Belmond Royal Scotsman’s excursions include castles, distilleries and boating trips on Scotland’s lochs. The Eastern & Oriental Express, operated by Belmond, runs a core route between Bangkok and Singapore via Kuala Lumpur, carrying up to 132 passengers in en suite cabins. Three dining carriages serve European and Asian cuisine and a Bar Car puts on nightly entertainment. The core route gives Belmond the flexibility to diversify itineraries, season-by-season, adding special departures or new routes and destinations. This year, for instance, the two-night “Ancient Temples of Lanna” sets out on its inaugural journey on Oct. 15, from Bangkok to Chiang Mai. This trip can be combined with the Belmond Road to Mandalay, which will celebrate its 20th anniversary with a series of Irrawaddy River cruises. Belmond’s Venice Simplon-Orient-Express,continues the legendary original Paris to London train, but under Belmond it’s more identified with its impeccable, almost royal, level of dining and service. The train offers 16 different routings, calling at such stations as Budapest, Innsbruck, Istanbul, London, Paris, Prague, Venice and Vienna. As always, the train revives the opulence of one of the most legendary luxury experiences in the history of travel. The cars are the original 1920s models with some cabins featuring adjoining doors that can be converted to “Cabin Suites.” WCs are located at either one or both ends of each sleeping car. Three restaurant cars and a bar car offer top-end dining and drinks. Belmond added a microsite on its website (belmond.com/lgbt-travel) for LGBT travelers looking to experience the full Belmond product line. India’s Maharaja Express carries 84 passengers in 23 coaches, including 20 Deluxe Cabins, 18 Junior Suites, four Suites and the Presidential Suite. The Maharaja Express, unlike any other Indian train, travels throughout the country on several different itineraries ranging from three to seven nights. On all journeys, travelers visit the Taj Mahal. Unlike most other luxury trains, this one was purpose built for luxury. The Observation Lounge has a bar, game table and club armchairs. Dining options include two restaurants, each seating 42 people. There’s a separate Bar Car. Off-train excursions complement the luxurious onboard experiences. Celebrity chefs, guest lecturers and other India luminaries are featured on many departures. The Seven Stars of Kyushu is an extremely exclusive luxury service that has created a new appetite in Japan for rail journeys. The $33 million train sells out and must be booked months in advance. Seven Stars of Kyushu carries up to 30 passengers in 16 suites in seven carriages. It features a nearly one-to-one staff-to-guest ratio. The train runs at an amiable 40 miles per hour on two- and four-day itineraries from Fukuoka in Kyushu, the southernmost of Japan’s main islands. It visits Oita for the Yufuin hot-spa resort and Miyazaki, Kagoshima, Nagasaki and volcanic Aso, with an overnight ryokan stay outside of Kagoshima. There are plenty of excursions along the way. Australia’s Ghan and the Indian Pacific trains are both authentic icons of Australia’s pioneer history and both operate transcontinental routes. The Indian Pacific crosses Australia from the Indian Ocean to the Pacific Ocean, Perth to Sydney. The Ghan runs north and south from Adelaide to Darwin. If you’re booking groups, look into the self-contained charter carriages available on both trains. They can be hired for small conferences, meetings and groups or for families and friends. South Africa’s famous Blue Train is really two separate trains running two routes. One train accommodates 74 guests in 37 suites in 17 carriages, the other hosts 58 guests in 29 suites and 16 carriages. Both feature observation cars, butler service, dining cars and multiple lounges. The Blue Train goes to places in South Africa that you would never see on your own, crossing gold fields, farms and vineyards between Cape Town and Pretoria. The Golden Eagle Trans-Siberian Express from Moscow to Vladivostok, brought luxury to the legendary route. The train has three levels of service: Gold, Silver and New Heritage class. Golden Eagle features two 64-seat restaurant cars. Every Golden Eagle journey includes a tour manager, a translator and an English-speaking doctor. It’s all-inclusive, including drinks during meals and tips.